Webster University’s 98th Commencement ceremonies take place on Saturday, May 13, in St. Louis at the historic outdoor amphitheater, The Muny in Forest Park. 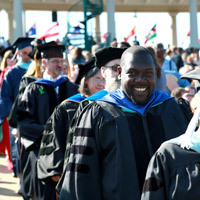 There will be bus transport on Friday, May 12, for faculty and staff participating in Commencement rehearsal. On Saturday, May 13, chartered buses will also be available to transport Commencement staff and participating faculty to and from campus. There is no formal sign-up required to ride the buses on either day. Turnitin and Canvas have recently released a new Turnitin-Canvas integration which will be ready to use starting Spring I, 2017. All faculty teaching online will need to view assignments that use Turnitin in their course prior to graduate students returning on Jan. 6 or undergraduate and School of Education graduate students returning on Jan. 13. Applications for the Leif J. Sverdrup Global Teaching Fellowship open for Spring, Summer 2018 on Jan. 9, 2017. The Leif J. Sverdrup Global Teaching Fellowship is a revision of Webster’s in-network faculty mobility program. The fellowship funds travel, housing and some incidental costs. Both full-time and adjunct faculty are eligible to apply. Full-time faculty must have completed at least one academic year at Webster to be eligible. Adjunct faculty must have taught at least six courses at Webster to be eligible. The submission deadline for applications is Feb. 15, 2017. Bill Barrett’s review of a Dorothy Day book appears in the Catholic Worker, Linda Woolf was named to an APA committee on secondary schools, Katie Ervin, Gary Hobin and Mark Wilcox joined the CGSC Foundation National Security Roundtable, and Mehdi Ali was an oil analyst at the Nov. 30 OPEC meeting. School of Communications adjunct faculty member Jessica Brown Billhymer's op/ed on teaching media literacy to combat fake news appeared in the Post-Dispatch, James Harrison was quoted in Webster-Kirkwood Times on the sale of Wehrenberg Theatres, and Webster Thailand's Kenneth Houston's piece on identity politics and Trumpism was published in World Politics Journal. Learn more about Margie Muthukumaru, Webster’s director of enterprise information systems, who will serve as interim chief information officer effective January 2017. Muthukumaru joined Webster in 2010 and has led enterprise information systems. She has served on a number of leadership bodies with Webster, including the Strategic Plan Steering Committee.